Whilst much recent research has dealt with the popular response to the religious change ushered in during the mid-Tudor period, this book focuses not just on the response to broad liturgical and doctrinal change, but also looks at how theological and reform messages could be utilized among local leaders and civic elites. It is this cohort that has often been neglected in previous efforts to ascertain the often elusive position of the common woman or man. 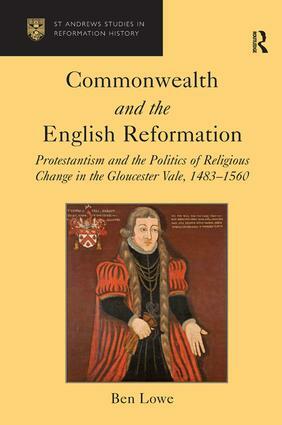 Using the Vale of Gloucester as a case study, the book refocuses attention onto the concept of "commonwealth" and links it to a gradual, but long-standing dissatisfaction with local religious houses. It shows how monasteries, endowed initially out of the charitable impulses of elites, increasingly came to depend on lay stewards to remain viable. During the economic downturn of the mid-Tudor period, when urban and landed elites refocused their attention on restoring the commonwealth which they believed had broken down, they increasingly viewed the charity offered by religious houses as insufficient to meet the local needs. In such a climate the Protestant social gospel seemed to provide a valid alternative to which many people gravitated. Holding to scrutiny the revisionist revolution of the past twenty years, the book reopens debate and challenges conventional thinking about the ways the traditional church lost influence in the late middle ages, positing the idea that the problems with the religious houses were not just the creation of the reformers but had rather a long history. In so doing it offers a more complete picture of reform that goes beyond head-counting by looking at the political relationships and how they were affected by religious ideas to bring about change. Contents: Preface; Introduction; Government, business and urban politics in late medieval Gloucester; Gloucester's ecclesiastical community and education during the Middle Ages; Gloucestershire's leading gentlemen before the Reformation; The Gloucester Vale on the eve of the reformation (1520-1540); Gloucester during the great transfer (1536-1551); The Gloucestershire gentry during the great transfer (1540-1551); Commonwealth and reform: Bishop Hooper in Gloucester (1551-55); A troubled city (1555 and beyond); Appendices; Bibliography; Index. Dr Ben Lowe is Associate Professor of History and Director of Graduate Studies at Florida Atlantic University, USA.